My littlest has now turned nine weeks! He currently weighs 8lb10oz, which is a 1lb6oz gain in 3 weeks which I am very happy about. He is taking 3oz of formula every 4 hours including the night, so one tired mama here still. 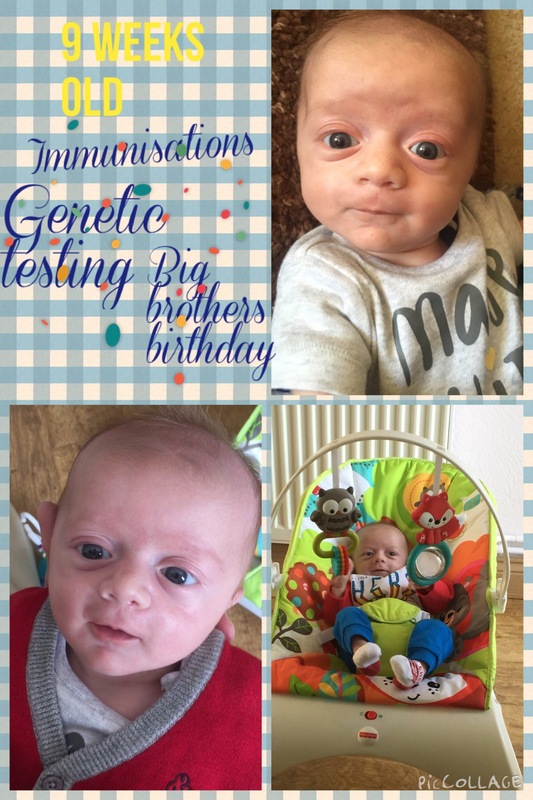 He has been through the mill a bit this week after having his first set of immunisations and then the genetic testing the day after, he took it like a trooper though bless him. This week I have noticed Jacob kicking his toys on the bouncer with his feet rather than with his arms (the toys are out of his reach) this is a massive achievement for him and his development as he does have a congenital condition that has caused some issues with both of his forearms. He’s also giving plenty of smiles now too, even to his toys. Tomorrow is Jacobs big brothers 2nd birthday so look out for Frankie-George’s 2 years of life update soon. Thanks for reading my loves, catch up next week for his 10 week update.